If you want to give yourself a headache then by all means head over to the EPCR site and try to make sense of the rules surrounding the Champions Cup semifinals. Now before anyone jumps down my throat for committing the heinous sin of presuming Leinster are going to win our home quarterfinal, I probably should explain. The reason I'm talking about the semifinal rules is that I want to know if there is any major advantage to finishing first in the seedings after the pool phase. The answer is no, not really. Should we be number one seed and win our quarterfinal, whether or not the semi is at the Aviva depends on the result from the 4th seed v 5th seed match...we would play the winner, but only in Dublin if it's the 4th seed. See what I mean about the headache? Anyway...let's face it...isn't it awesome that we're going into Round 6 safe in the knowledge that we've the home quarter in the bag? Much, much better to focus on that. And despite a few tweaks to the lineup here and there, it certainly doesn't look like Leo and co consider the 23 out of 25 points we have earned so far in this tricky pool to be enough. I suppose the first thing we must do is answer the age old question...which French team is going to show up? On the positive side they seem to have a full strength team [with Aaron Cruden available unlike the match at the RDS] and you'd generally be crazy to rule out a Top14 side at home, especially when it's one that's top of the league right now. That said, their position in the league could well direct their minds towards their trip to Clérmont next weekend, especially since they know even a bonus point win might not be enough to reach the last eight. So, much like my semifinal research, we really don't learn a whole lot from exploring the MHR side of things. Which leaves us with our side...names like Sexton and Fardy may be conspicuous by their absence, but there is plenty to suggest we can really take this game to our hosts, and my starting point is at scrum half. My biggest criticism of Jamison Gibson-Park has been that he seems to find it difficult adapting his game to the demands of northern hemisphere rugby, or perhaps more to the point, Schmidt-sphere rugby. For example, pinpoint box kicks designed to win possession back aren't exactly his forté. But now I'm thinking - maybe this could be an advantage for both him and Leinster? Once he's allowed to play more the way he knows how that is, namely at a high tempo. I singled the Kiwi out for a couple of knockons against Munster on St Stephens Day but to be fair to him he seems to be making more of an effort to stand out and if ever there was a big match for him to prove himself, this is it - he's only up against Ruan Pienaar, after all. This could be the matchup that decides this contest. Another could be Jordan Larmour v Nemani Nadolo. 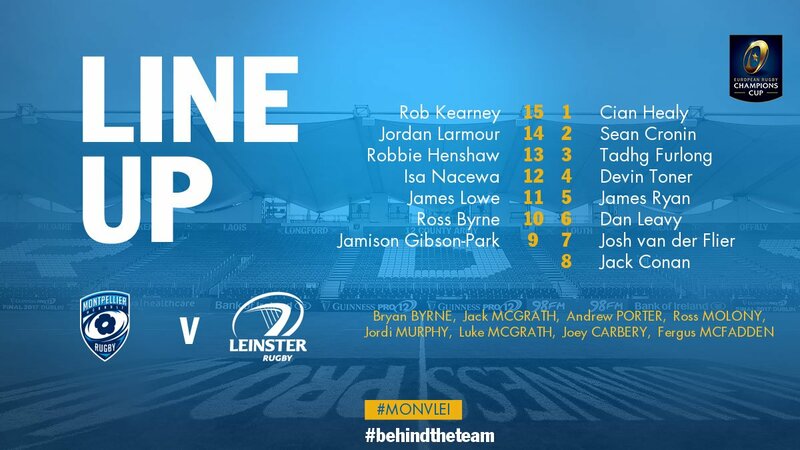 Neither needs introducing to Leinster fans by this stage, but the challenge is made greater for Larmour in that his chances on the wing have been few and far between this season which makes this something of a baptism of fire. Naturally we can't ignore the scrums. This is an area we have taken for granted this season, partly because we've had more issues in the lineout, but this combination of occasion and opposition could be exactly the challenge our tight eight needs. I could delve deeper into the matchday squads but when you realise that the bookies can't separate these two teams, it becomes clear that this is likely to be one of those games that could hinge on the bounce of a ball or a contentious decision by the ref. I'm in a mega positive frame of mind these days so I'm going to predict that we'll nick it by a few points but it really could go either way and thus should be worth watching no matter what. 16 Romain Ruffenach 17 Yvan Watremez 18 Mohamed Haouas 19 Julien Delannoy 20 Fulgence Ouedraogo 21 Gela Aprasidze 22 Joe Tomane 23 Jesse Mogg.